When the temperatures drop below zero (Celcius that is), outfits turn practical and layering becomes essential. Many people turn to chunky knits but my favourite way to stay fashionably warm is with sweater dresses and thick tights. As a true dress devotee I'm loyal to dresses, no matter the weather! Are you a (sweater) dress devotee? Ooh both dresses are so cute! Great colors in each too! 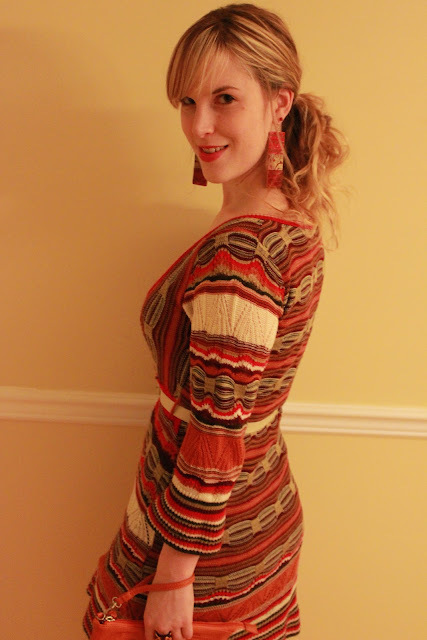 I have just discovered the wonder of the sweater dress (wearing one today in fact!) and I think I am in love! I love both of those pretty sweater dresses! I have a sweater dress that I bought earlier this year, but I still haven't worn it. It really hasn't been cold enough yet, but I'm sure soon I'll be busting it out! 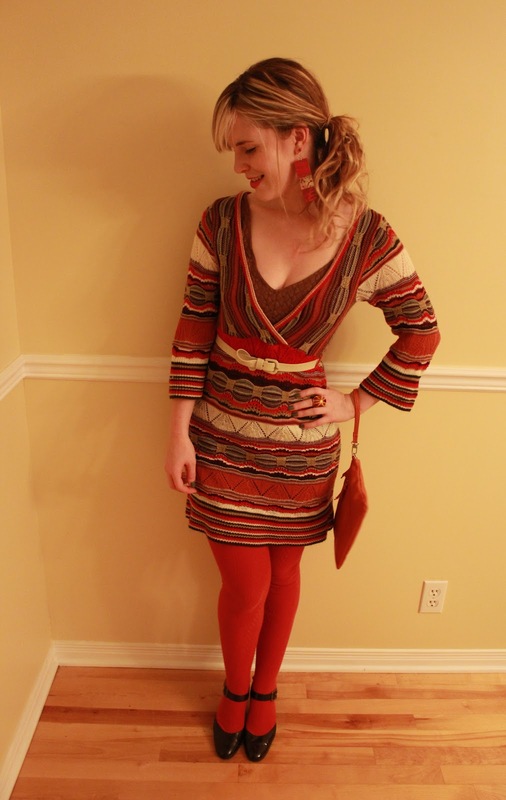 I love love love sweater dresses and I love this on you : ) you love amazing! Love both of them! The 2nd one reminds me of missoni! I love sweater dresses, but they don't usually look good on me. Anyhow, they look terrific on you! Love the colors in both dresses. Cute looks! I know, I really do love dresses. I'd rather wear a dress than any other article of clothing... except maybe a coat dress, haha. Amazingly, it hasn't been very cold here lately. I haven't even worn my gloves yet! Although if you ask my friends, they'll just say I'm a freak... apparently I'm just cold blooded. you and I both, Emily! You and I both! No matter how cold it gets, I will ALWAYS wear dresses! Love both of these ones, especially the striped one! Both dresses are so cute! The colours and patterns are perfect - very chic and cozy! Those earrings could not be more perfect with your dress!! Love how they make a statement all on their own. you rock both looks, colorful tights for warmth down to every last accessory, and pretty hair style. i think i wear skirts far more than dresses. i do like dresses too. sweater dresses are the best! i love the two you are modeling here. fabulous color! love your shoes and tights in the second outfit pic. nice!!! love sweater dresses! and yours are so cute! you’re gorgeous!! I’m so glad I found your blog, this sweater dresses fits you perfect and sounds amazingly comfy! !